Now, you probably think you’ve been here before with Scandinavian-based online slot developer NetEnt. There’s the intergalactic setting, the stunning visuals and the extraterrestrial sounds. You would not be called a fool for thinking Net Ent had released an unofficial sequel Elements – The Awakening. Alas, Elements – The Awakening Part II this slot is not and here we have another aesthetically beautiful slot but the key question is whether or not the game play lives up to the hype that slot releases from Net Ent have come to demand. At first glance, the signs are all good but as a reviewer I have been here time and time before where a slot has the hype, it has the visuals but the game play lets it down. This 5-reel, 25-payline online slot has all the initial ingredients of a sure fire hit of a slot. The symbols are mesmerising in the form of different planets. Even the regular symbols have a celestial cosmic glow surrounding them that gives the feeling these symbols are worth something. One of the things you will notice immediately on this slot is the presence of a Multiplier Meter on the left of the reels. This meter goes up to a value of 32x meaning that players can hit a multiplier value of up to - you guessed it - 32x on their wins. The meter works by moving up a multiplier every time you hit a consecutive winning combination on the reels. You would need to hit six winning combinations in a row to reach the 32x multiplier mark. During my time playing I found it to be quite a tease because numerous times I hit the 4x multiplier and 8x multiplier marks before failing to hit another winning combination and dropping back down to 1x. You can’t complain against a 4x or 8x multiplier, though! The Wild Sun symbol is also present as the Wild on this slot. This symbol will replace all other symbols on the reels to complete winning combinations. In addition, it can play a key role in helping you hit consecutive winning combinations to help bump up that Meter a little. If you're looking for free spins or a Pick'em Bonus, you're (big) bang out of luck. 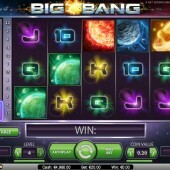 Big Bang does not have any free spins bonus round or Pick ‘em Bonus features; in fact, if the Meter doesn't excite you you'll probably find the game a little one-dimensional. 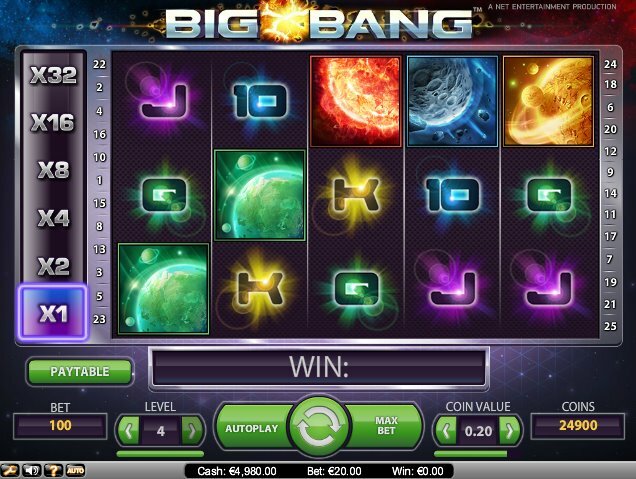 As I mentioned earlier, this slot does hold a strong similarity to the other effervescent NetEnt slot Elements – The Awakening but the atmosphere of this slot is also very reminiscent of another Net Ent game - the colorful Starburst slot. There's no doubt that this slot is a slow burner and will draw you in quietly. Next thing you know, it’s 2am, you’ve lost all your money and you’ve still not hit that 32x multiplier mark!